Boffa Miskell was engaged to design a niche wall (wall with places to inter ashes behind memorial plaques) for the historic cemetery at St John’s College. 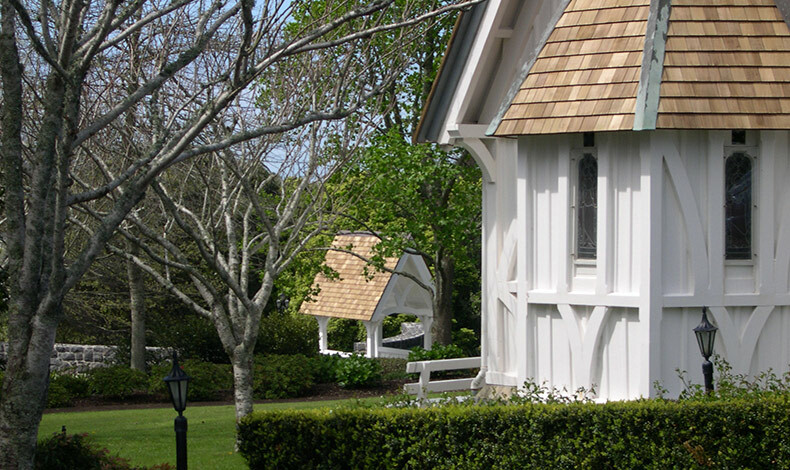 St John’s College is the theological College where ministers in the Anglican and Methodist Churches are trained in Auckland. The site, with a north facing aspect, is partially enclosed by a large number of mature trees, but also views out to the Waitemata Harbour and Rangitoto Island. The cemetery area has the delightful informal feel of an old cemetery and the historic St John’s Chapel is adjacent to the area. The brief sought a solution which provided demarcation for the cemetery area, but respected the historic informal character of the space. The design nestles the wall into the slope and includes a lynch gate (entry structure) and bollards around the edge of the area designed to match the chapels architecture and detailing. The project involved obtaining a resitivity survey to ensure 24 unmarked graves within the area were not disturbed. Arborists and archaeologists subsequently monitored the site as contractors began work. The contractors skilled specialists worked to their highest standards. The completed project now sits on the site as though it were always there. Awards It was awarded an NZILA Silver Award in 2006.